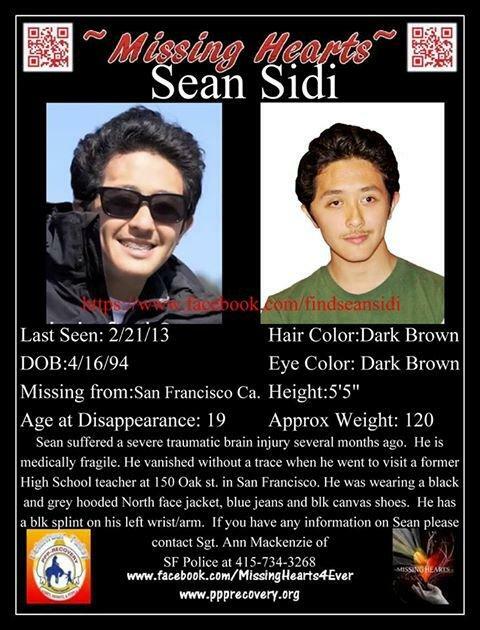 The Sean Sidi Family is holding an Awareness Vigil on Sunday to convey a strong message to the SFPD and the San Francisco Community that Sean's disappearance needs to be escalated to a higher level because of his traumatic brain injury. The SFPD has not accommodated the Sidi's request as of yet, despite requests upon national and local experts. We need your support! WHAT: The Sean Sidi Family will be holding a vigil to broaden public awareness about their missing son Sean Sidi. 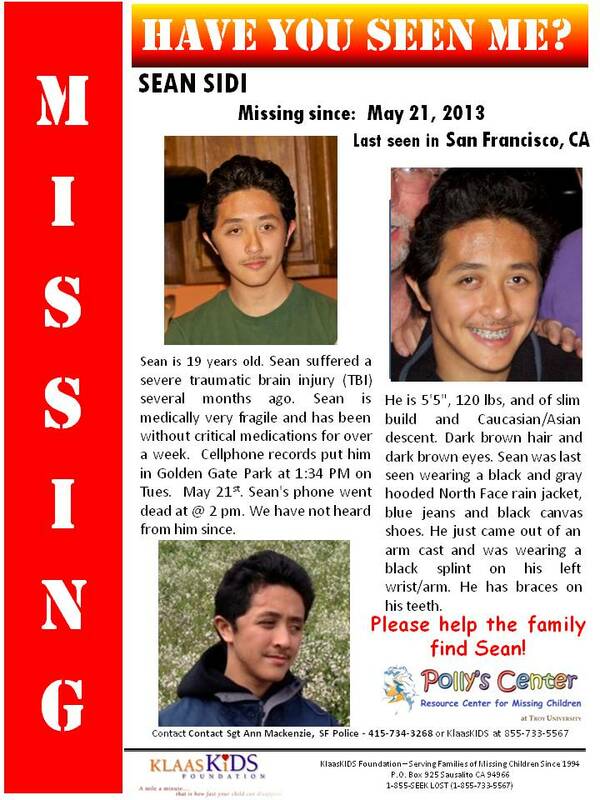 WHEN: Sunday, June 23rd at 2:00 p.m.
WHY: The purpose of the Awareness Vigil is to raise public awareness of the search for their medically vulnerable son, Sean Sidi, who vanished from San Francisco on May 21, 2013. The family will speak of developments in their search for Sean, including requests made to law enforcement. 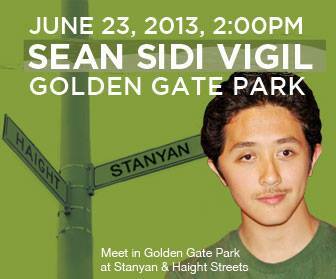 The Sidi family will be holding a 'Search for Sean Awareness Vigil' Sunday, June 23rd at Golden Gate Park. The purpose of the Awareness Vigil is to raise public awareness of the search for Sean and to remind the public that he is medically fragile. The family will speak of the developments in the search, including requests made to law enforcement. Please help spread the word. We hope to see you there. Thank you for your continued support. Where: Meet at Ocean Beach Parking Lot - Across from the Windmill on the Great Highway, SF. What to Expect: We are looking for clues at the request of the PI and in following up on certain 'tips' received. STATUS UPDATE - NEW INFORMATION - (June 14, 2013): The family hired a nationally recognized private investigator with extensive experience in finding missing persons. He has advised us that it is IMPERATIVE that Sean's NCIC status be elevated to a person who is physically and/or mentally disabled. SFPD has been notified of this and given FBI information as well. Various professional search and rescue teams have offered their services for FREE. Due to jurisdictional issues, the SFPD must request these services, before the search teams can search for Sean in San Francisco. FOR SATURDAY, JUNE 15TH - GOLDEN GATE PARK: At the suggestion of the Sidi’s private investigator, the Sidi family is conducting a search of the western end of Golden Gate Park tomorrow (Saturday, June 15th). The focus will be in the areas not covered by the previous search in conjunction with the Klaas Foundation a few weeks ago. The search will begin at 9:30am. The meeting place for the search will begin at Ocean Beach Parking Lot across the street from the windmill on the Great Highway. Volunteers can check in at 9:30am. There is a large hearing and rally today on reforming the San Francisco Housing Authority. So there will be quite a few outreach people and directors of organizations attending. A target market that we need to reach ~ a great opportunity to reach a "mass" market. Police confirmed that the body found this Monday at the Hyde Street Pier is not Sean. Our hearts and prayers are with the other families awaiting word. Sean has now been missing for 3 weeks. We are focusing on contacting all homeless shelters, soup kitchens and social services agencies in San Francisco. The objective is to speak with the person in charge and leave Sean's flyer with them so that they can be on the lookout for Sean. There are so many of these places in San Francisco. Any assistance in the distribution of Sean's flyers to these agencies would be very welcome."